Friday, December 26th. . The alarm clock goes off at 4:15 a.m. It is time to get up, the pilgrimage is about to begin. Our bags are packed, loaded with warm clothes for the cold weather, sleeping bag and mat. It looks like it will be one of those good pilgrimages: with few comforts but with a lot of chances to offer things up. We agreed to meet at 4:45 a.m. at the sisters’ house. 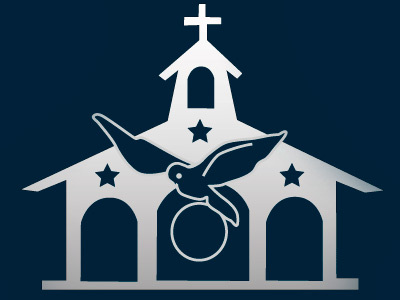 At around 4:30 a.m., some girls were already waiting in the chapel of the Divine Child in Guayaquil, as were the sisters who were welcoming the girls who were arriving. The first test that God gave us did not take long to arrive. At 5:00 a.m., the bus had still not arrived. Time goes by and nothing. At 5:30 the sisters decide to go and find another bus, but at 6 the previously hired bus driver shows signs of life and arrives at 6:10. The poor driver’s alarm clock had failed to go off. These things happen. In light of the situation, the first thing we did on the bus was to put our trip into God’s hands, so that He could do or undo as He saw fit, and that is how our pilgrimage went. Without our own plans but going with God’s plan, Sister Mercedes proposed as the motto of the pilgrimage: “Everything with Him and for Him”. Well, we then left Guayaquil at 6:15 a.m., nearly two hours later than we had expected to leave; we stopped along the way to have breakfast and continued our journey to Quito. We arrived at the place, where we would be staying, at 4:30 in the afternoon and we were hungrier than an abandoned dog. So the first thing we did was eat, in order to make it to 6 o’clock mass. 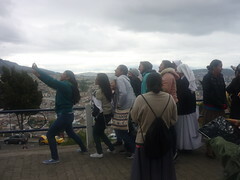 On that first day, we strolled through the streets and the central square of Quito. At night it is very beautiful because of the lighting system that they have. You could also see the Nativity which had been built with lights on the same mountain in which the famous 'Panecillo de Quito' is located which is 3,000 meters above sea level. It was all so beautiful. After walking around and taking a few pictures, we returned to the school and there we had dinner and said good night to be able to sleep well. By then we were already very tired. 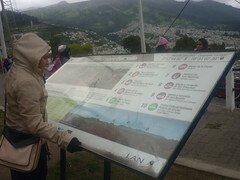 The change of climate and the altitude of Quito, had affected us a bit and we were very sleepy, so we slept like logs. The following day, having regained our strength, we went to the 7:00 a.m. mass at the convent of the Carmelites, had breakfast, had a time of prayer and began our walk around Quito. The first thing that we went to visit was the Church of the Jesuits. It is an impressive church covered with gold leaf and filled with art that lifts your spirit to God. We were very impressed with the last two paintings that they showed us and that were at the end of the Church: one on hell and the other on the final judgment and the sky. We meditated on the two paintings. We then walked to the Church of St. Francis, in which we saw the museum and the exhibits of the nativity scenes that they had. It was also very nice. With all this sightseeing the time for lunch had arrived, so we went back to the school and ate delicious rice with chicken. In the afternoon we agreed with the driver of the bus to drive us to the “Bun”. It was a little colder up there but it was worth seeing such nice views of the city of Quito and the four volcanoes that can be seen from up there. 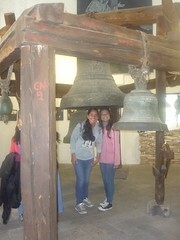 We prayed the Rosary; we had a time to do do more sightseeing and to buy souvenirs and then we returned to the school. It was already night time, so we prepared dinner and later we went out to the Basilica of the National Vote where we had a Holy Hour with the Blessed Sacrament exposed. There, they have it exposed during the whole night. It was a very nice moment in which we prayed for many things. On Sunday we visited the Carmelite Sisters at 8:45 in the morning and from there we went to mass at 10:00 a.m. with the Franciscans. We picked up and cleaned up everything in the school since the departure was planned for noon. So with food in tow, we went in search of the bus and left for the middle of the world. There we ate and then went back to Guayaquil. We arrived at midnight, tired but happy. God had poured out many graces. We now hope that we don’t forget them.